...... If you enable users to signup, authenticated users can gain access to your calendar (Admin Area). Admin Area include signup, login, forgotten password, & edit profile. The OrgCalendar gives you a customizable Resource Navigator, new Date Navigator, a comprehensive reminder, control over the events overlapping and a mechanism for sharing events between an arbitrary number of different resources. As such, it doesn't matter which resource types you need to display - human resources, medical department resources, labs, salons, repair shop, etc. 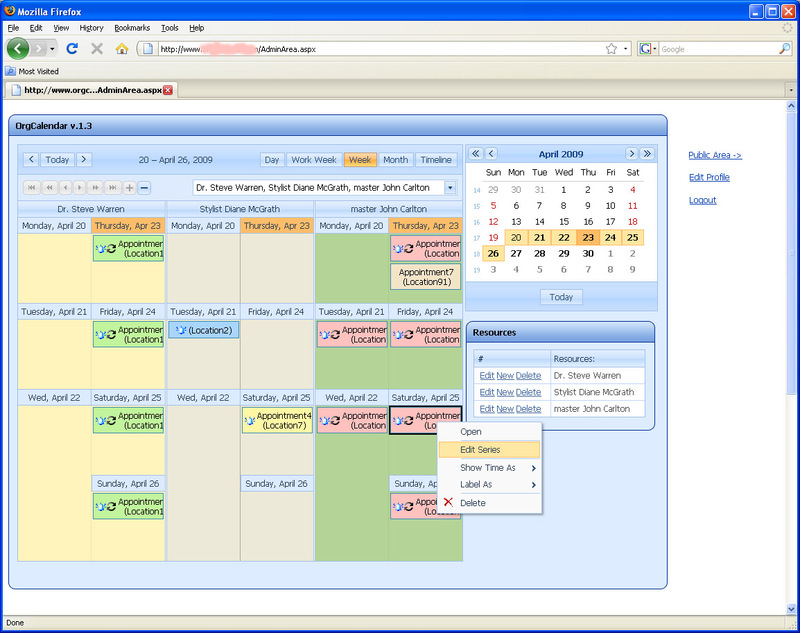 Once resources have been created, the scheduler will display several parallel timelines. If you don't believe it's that easy and if our online demos don't convince you, feel free to download an evaluation version and try it for yourself. What do you need? Hosting Type: Windows Hosting (ASP.Net). Qweas is providing links to OrgCalendar (WEB) 1.9 as a courtesy, and makes no representations regarding OrgCalendar (WEB) or any other applications or any information related thereto. Any questions, complaints or claims regarding this application OrgCalendar (WEB) 1.9 must be directed to the appropriate software vendor. You may click the publisher link of OrgCalendar (WEB) on the top of this page to get more details about the vendor.